San Antonio Spurs star Tim Duncan has reached a consistent level of success nearly unmatched in NBA history. At 38 years old, Duncan is still a massively important member of a team one win from its fifth NBA title in his 17 seasons. While he has never courted much attention in his career, being on the brink of a fifth championship tends to compel a lot of consideration of an all-time great's career and legacy. To drive the point home even further, Duncan added two more records to his illustrious list of accomplishments in the Spurs' dominant Game 4 win over the Miami Heat. With 10 points and 11 rebounds in 31 minutes, Duncan broke the NBA career playoff records for minutes played and career double-doubles, surpassing two former Hall of Fame Los Angeles Lakers teammates in the process. Duncan figures to add to that record considerably if he continues his career past this season — the Spurs look as good as ever and could make another title run next year — but Kobe Bryant has a chance to top Duncan's mark soon if the Lakers' fortunes improve. Although LeBron James lags more than 2,000 minutes behind both players, he could challenge the record later on in his career. For comparison's sake, Wilt Chamberlain holds the best double-double rate of this quartet at 89.4 percent of his 160 postseason appearances. 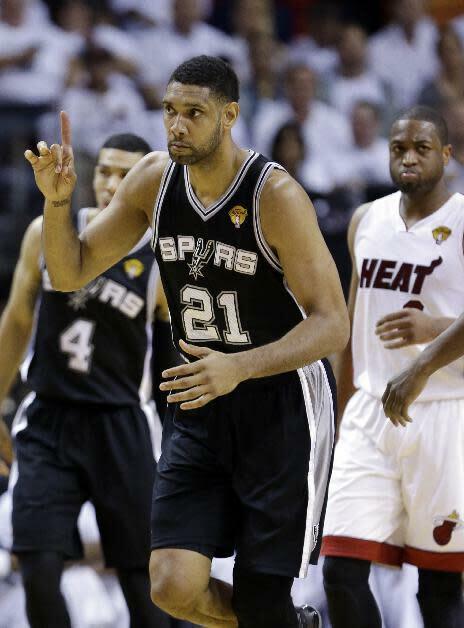 Duncan has averaged a double-double in 11 of his 16 postseasons (he missed the 2000 playoffs with a knee injury). He is unlikely to achieve that mark in this postseason, barring a rebounding onslaught to end the Finals, but at 16.4 points and 9.2 rebounds he's not that far off. I can appreciate you saying the names and having passed them in anything. It's an honor to be in that position. Having won helps, but the focus is winning one more. Once the winning is done, I can look back and say it was truly an honor. These are both career records, but few players in history have been quite so effective at such an advanced age. With the remaining length of Duncan's career in doubt, it's best to appreciate his skill while we can still witness it.